Liberty and Comfort for All! The idea for Zotto arrived purely by accident. At a backyard barbecue, Zotto co-founder Shawn Keep complained to a friend (who happened to be in the foam-making business) how he was waking up with back problems. His friend suggested he try a memory foam mattress and offered to make him one. Shawn took him up on the offer and they went to work experimenting with various formulas. They finally landed on a combination that found Shawn waking up without back pain, he loved it but there was just one problem – it slept hot. Really hot. We’re talking sauna hot! (Not surprising since memory foam mattresses had a reputation for sleeping hot.) So Shawn went back to the drawing board. Dozens of temperature regulating and phase-change materials were tested until they discovered a dual phase-change material that not only kept the mattress cool, it was actually capable of redistributing heat if the mattress became too cold. This was a technology not found anywhere on the market. Right away Shawn realized that a mattress that could address back-pain and temperature regulation would be widely popular. He contacted his best friend Pat about mass-producing the mattress. Pat agreed that this mattress formula would change the way people sleep, and more importantly, how they would feel after waking up. 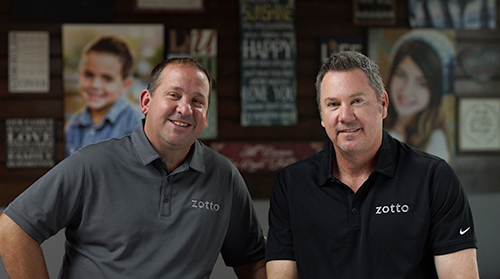 2015, The Zotto mattress was born! The partners gave several Zotto mattress prototypes to friends and family and their mission to create the best sleep ever was quickly validated – everyone loved their new Zotto! The Zotto isn’t just a memory foam mattress, it’s a cutting-edge convergence of sleep technology that delivers unparalledl pressure point relief and temperature regulation, and extreme comfort! We’re extremely proud of our “baby” and we both personally enjoy the kind of sleep we used to dream about. We want the same for you!